Despite this, funding for the performing arts and teaching the performing arts have decreased dramatically over the years as many do not see the ongoing value of teaching performing arts to the next generation. According to a recent survey, 55% of public high schools and 96% of public elementary schools in the United States do not offer theater or drama as part of the curriculum. Both vocal and instrumental music education has also decreased as funding for education decreases and districts are forced to make cuts. Despite the decreases in education, the love for performance art has not diminished. Regardless of the type of concert. Event, people are attending in groves. One survey showed that within a single month 47 million Americans attended a live theater event, and roughly 18 million attended a symphony concert or opera. According to the National Endowment for the Arts, over 30% of all American adults have attended a live performance of some kind. Over 40% of adults in the United States report creating their own art or personally performing in a concert. Event or other type of performance. 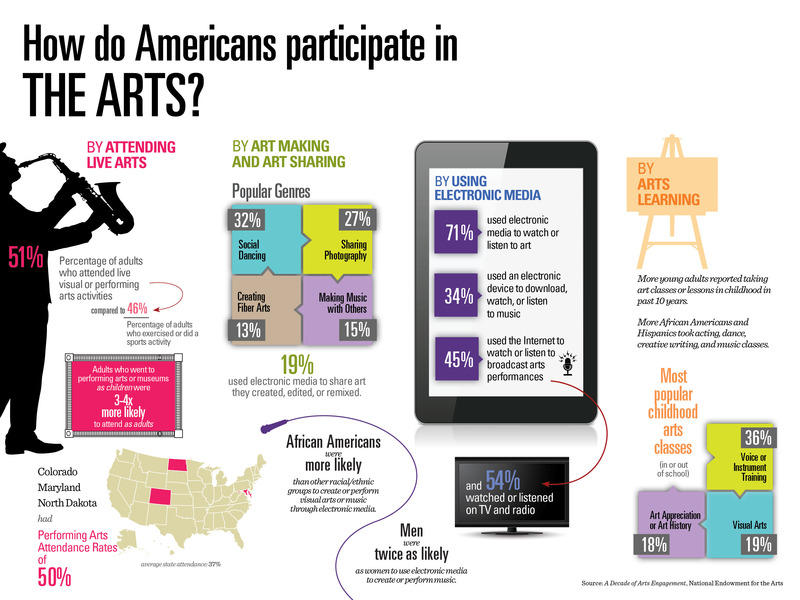 This statistic has remained level over the course of several years as American adults enjoy the personal expression offered through art. The National Endowment for the Arts has conducted a great deal of research to fully understand the role of art in current culture and to seek out and provide funding in areas that are the biggest need. For example, according to their reports, over 70% of adults enjoy perspectives and performances that are outside what they would normally enjoy. Nearly 40% of art attendees enjoy experiencing new things through performances. 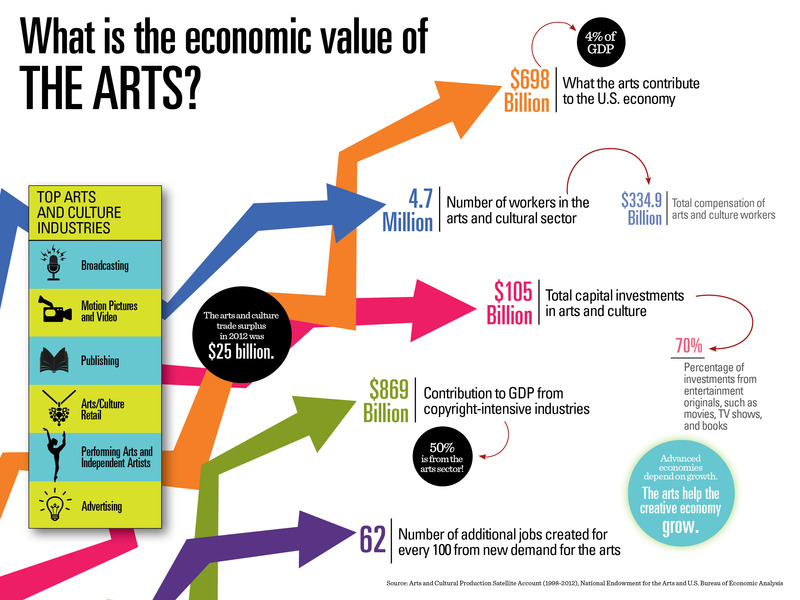 They also found that the arts contribute nearly $700 billion to the United States economy each year. This is a tremendous amount that supports arguments in favor of providing better funding for the arts through educational options for both children and adults. The arts also creates a number of jobs through not only the performers, but the set crews, helpers, coaches, ushers, promoters, and more. There is a great ripple created within the economy starting with the arts. Aside from the economic benefits, the teaching of and participation in the arts has many intrinsic benefits as well. For example, students who study art are four times as likely to score high academically than students not involved in the arts. Additionally, these students are three times more likely to be recognized for good attendance. This includes students in vocal and instrumental music, drama or theater, and visual arts. A great way for parents to support their children’s interests and efforts within performance art is to encourage them to practice, provide encourage, and attend their concert. event or performance. Investing in private lessons, acting classes, and personal development opportunities is also a great way to support a child interested in art. The benefits of being involved in the arts is not limited to children. Adults can benefit emotional and mentally from the creative outlet, sense of accomplishment, and personal joy that can be found in learning new things, interacting with others who have similar interests, and feeling accomplished. Mental health is a significant issue in America, and the benefits of art have been supported through research. This has been reinforced through the use of art therapy and role play within therapy. Another way to support performance art is to help fight for the inclusion of performance art within public schools. This can be done by petitioning local politicians, supporting arts related levies, and being vocal with school boards about the importance of maintaining an art program. Even is you don’t have a student in the school system, attending a concert. event or performance will also show community support for the school program.